LIVE! On Sunset is hosting a fashionable fête for online celebrity-style gurus, Hillary Kerr and Katherine Power. The duo co-founded WhoWhatWear.com, an online fashion magazine, and recently penned a new book, Who What Wear: Celebrity and Runway Style for Real Life (available for purchase in-store at LIVE! On Sunset). 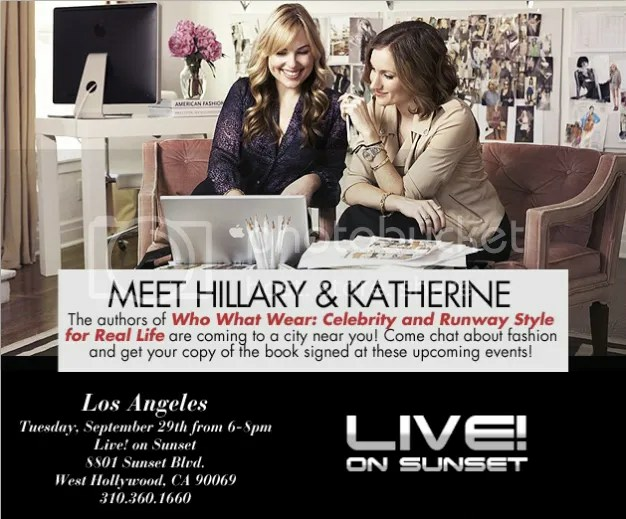 YOU can come meet Hillary and Katherine at our store and get a copy of their book signed! Put on your statement platforms and come join what’s sure to be a fabulous gathering of taste-makers and fashion-lovers alike. There’s a new angel in town Charlie, the Vox Boot. Just in time for Fall, Velvet Angels has added an irresistible ankle boot to there collection of sassy yet sophisticated shoes. The suede Vox boot, is trimmed with patent leather that can be dressed up for a night on the town or down for lunch with a gal pal. Since their launch in 2008, Velvet Angel’s ultra luxury shoe styles have quickly become a Fashionista favorite! Just ask Rihanna, who can be found trotting around town in hers. Click Now to check out our Velvet Angels collection at Live! There’s been a buzz surrounding Archive Jewlery lately. The vintage line that consists of one-of-a-kind pieces can be seen in Lucky, Marie Claire, and Apparel News this month. Archives eclectic jewelry line has been a growing favorite at Live on Sunset! It’s not just us going gaga over Archive , our celebrity friends Hallee Berry, Michelle Trachtenburg, Ashlee Simpson, Taylor Momsen, and Lauren Conrad all accessorize with Archive! Updating vintage looks for the modern woman is the key inspiration for designer Ashley Ann’s MYNE: the line that perfectly balances old-Hollywood glamour and casual sophistication to create a California feel that perfect for any girl looking for fun. A flawless combination of fashion and function, MYNE offers well-designed pieces in silhouettes that are simple yet feminine. A celebrity favorite, this beautiful skirt was spotted this week on the set of The Daily 10. Come into LIVE! On Sunset to see all the new fall arrivals from one of our all time favorite designers.